In March 2014, The People for Change Foundation encouraged candidates in the upcoming European Parliament election to endorse a pledge against racism, and to ensure that political discourse and actions during the campaign do not promote, instigate or condone racism and xenophobia. To deal responsibly and fairly with sensitive topics relating to migrant groups and ethnic minorities, including asylum seekers and refugees; to safeguard their dignity and avoid their stigmatization. To adopt appropriate, accurate and sensitive language when referring to and discussing migration and migrant groups in order to avoid fuelling xenophobia, unfounded fear, crisis and moral panic. To condemn, and wherever possible stop, any materials or statements that intentionally or indirectly incite hatred or express prejudice on the grounds of race, colour, nationality or national origin, ethnic background, migrant and legal status or religious belief. To refrain from political alliance or association with any political party, or organization that incites ethnic prejudice and racial hatred. The pledge is being made available to MEP candidates from 13 March 2014, and the names of signatories will be added here on a regular basis. 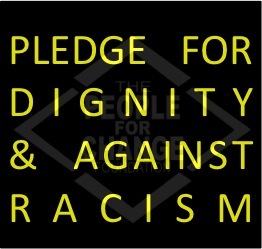 March 13th 2014: Campaign Launched, MEP Candidates contacted with an invitation to endorse the pledge against racism and xenophobia.